Extratropical transition (ET) is the process by which a tropical cyclone, upon encountering a baroclinic environment and reduced sea surface temperature at higher latitudes, transforms into an extratropical cyclone. This process is influenced by, and influences, phenomena from the tropics to the midlatitudes and from the meso- to the planetary scales to extents that vary between individual events. 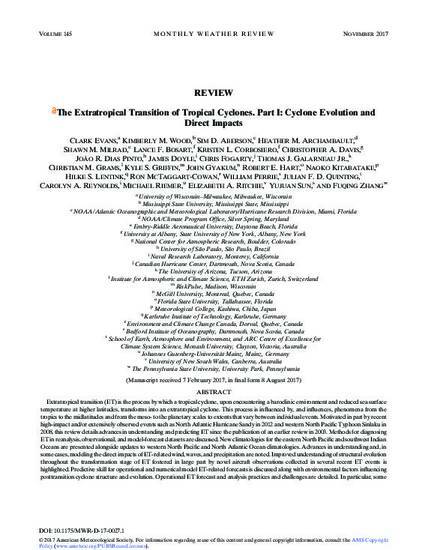 Motivated in part by recent high-impact and/or extensively observed events such as North Atlantic Hurricane Sandy in 2012 and western North Pacific Typhoon Sinlaku in 2008, this review details advances in understanding and predicting ET since the publication of an earlier review in 2003. Methods for diagnosing ET in reanalysis, observational, and model-forecast datasets are discussed. New climatologies for the eastern North Pacific and southwest Indian Oceans are presented alongside updates to western North Pacific and North Atlantic Ocean climatologies. Advances in understanding and, in some cases, modeling the direct impacts of ET-related wind, waves, and precipitation are noted. Improved understanding of structural evolution throughout the transformation stage of ET fostered in large part by novel aircraft observations collected in several recent ET events is highlighted. Predictive skill for operational and numerical model ET-related forecasts is discussed along with environmental factors influencing posttransition cyclone structure and evolution. Operational ET forecast and analysis practices and challenges are detailed. In particular, some challenges of effective hazard communication for the evolving threats posed by a tropical cyclone during and after transition are introduced. This review concludes with recommendations for future work to further improve understanding, forecasts, and hazard communication. Copyright 2017 American Meteorological Society. For information regarding reuse of this content and general copyright information, consult the http://www.ametsoc.org/PUBSReuseLicenses for information about reuse.